Through Social Justice Ministry we create a world where everyone can reach their potential, and justice, equity and compassion define our relationships with each other and the world. For many folks, working on social justice is how they live out their faith. It is why they join a religious community. It may be the one of, if not the primary, reason you are drawn to the Unitarian Universalist Church of Long Beach. 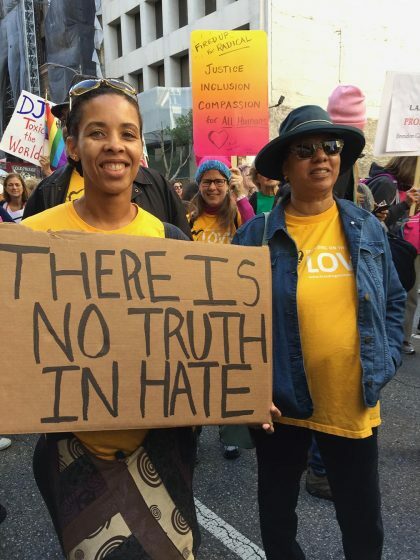 Here at the Unitarian Universalist Church of Long Beach, we support and promote social justice in our congregation, community and the world at large in line with the values set forth in our Unitarian Universalist Principles – respect, fairness, democratic principles, right of conscience, and recognition of our interdependence. Social justice activities occur in many different places through the efforts of many different people. All are welcome to participate at any level – attend events, offer suggestions on projects, have input in meetings, lead an action – whatever your comfort level. The Social Justice Council and its standing and ad hoc groups provide our congregation and community a focal point for justice-focused efforts. Social Justice Standing Groups and ad hoc groups mobilize the energies and resources of the church. We promote congregational action through coordination, support, and advocacy in multiple areas: environmental justice, racial justice, immigrant justice, accessibility and inclusion, and interfaith community organizing (ICO). We also listen to the congregation and occasionally distill their sentiment into a resolution that reflect the will of the congregation and can be adopted by a vote of the members. Every month we have a special collection for a local community group or cause worthy of our financial support. Learn more about our recent special collection recipients.